Mr. Abdulrahman Abdulla Al Ansari, the renowned business man and a Govt. official of Qatar State ventured in to business at a very early stage of his life through food retailing chain of stores namely Family Food Centre. Being a young and outspoken entrepreneur, he participated in many business conferences and led many delegations in and out of Qatar. Today he owns as much as 35 companies in Qatar with high growth and complete success to his records. 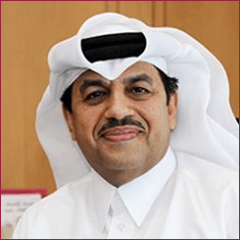 Mr. Abdulrahman Abdulla Al Ansari, the renowned business man and CEO in Qatar Industrial Manufacturing Co QSC which is one of the leading share holding companies in Qatar with varying business interest in Manufacturing, Construction, Cryogenic Gases & Jet Fuels, Aluminium Extrusion Etc. He also serve as Board Member at Qatar Oman Investment Co, Qatar Clay Bricks and Qatar Metal Coating WLL. Few other privately owned business interests of Mr. Abdulrahman Abdulla Al Ansari are as below. Managing Director: M/s. Family Food Center One of the largest Importers & Distributors of food & house hold items. Managing Director: M/s. Trans Tech Company A Germen collaborated Oil & Gas field materials supply and contracting company having prestigious clients such as Qatar Petroleum, Ras Gas etc. Managing Director: M/s. Micro World Micro World undertakes sales, service and maintenance of computers, mobile phones, accessories and software. Micro World is one of the authorized dealers of Dell computers in Qatar. Managing Director: M/s. Al Ansari and Partners Trading Mainly concentrates on imports and distribution of food and non-food products from India. The chief architect of MHD L.L.C., Mr. Mohsin Haider Darwish had the keen foresight to envisage the rapid economic development of Oman and the business opportunities that would emerge in the process. Accordingly he laid the foundation for MHD L.L.C. and steered it to meet the challenges of a nation on its path to rapid development and also measure upto the aspirations of its people. Today MHD L.L.C. is one of the major business houses contributing to the growth of the Sultanate’s economy. The origin of Mohsin Haider Darwish L.L.C. dates back to over half a century. The family proprietary business was converted to its present form of a corporate entity in 1987.Over the decades, the company has witnessed phenomenal progress, helped by strategic planning and professional management MHD L.L.C., with varied interests in trading, contracting, projects and manufacturing, has been successful in enriching people’s lives by sourcing the most reputed international brands from across the world and making them available to the discerning customers in the Sultanate of Oman. Vital to the success and growth of MHD L.L.C. has been its talented senior management, a select team of professionals who have been instrumental in crafting a business strategy & processes most suited for sustained growth. The company has over 1,000 employees on its rolls. The corporate office provides centralized services in areas such as Finance, HRD, Internal Audit, Computer Systems, etc., to the profit centers, ably assisting them in achieving the company’s desired objectives. The company is an ISO 9001 accredited organization, a pointer to its quality standards and systems that have been fine-tuned to perfection over the years.